Texas knows beef. Texas knows barbecue. 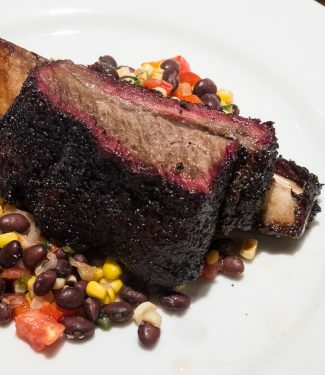 Shouldn’t be a big surprise to anyone that Texans make awesome barbecue beef. 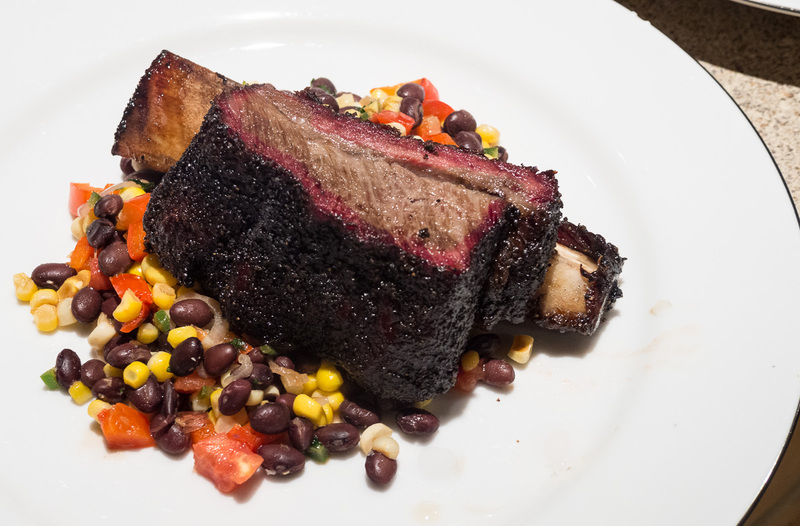 Making BBQ beef short ribs is an outstanding way to use a cut classically reserved for braising. Brisket gets all the glory and when its great it’s so off the scale wonderful it’s easy to understand why. 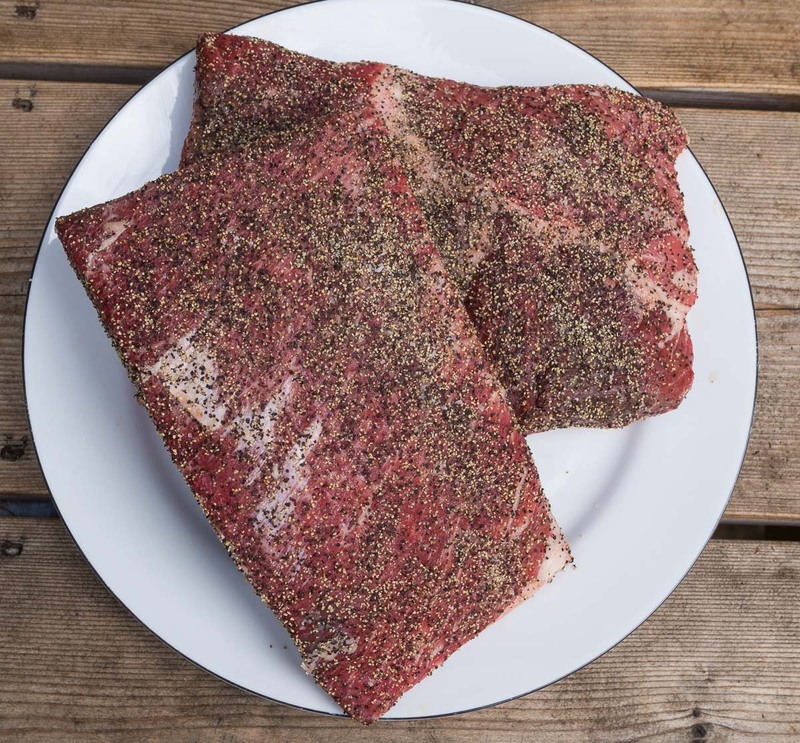 Brisket is hard to make though – which is why the famous pit masters in Texas are famous. 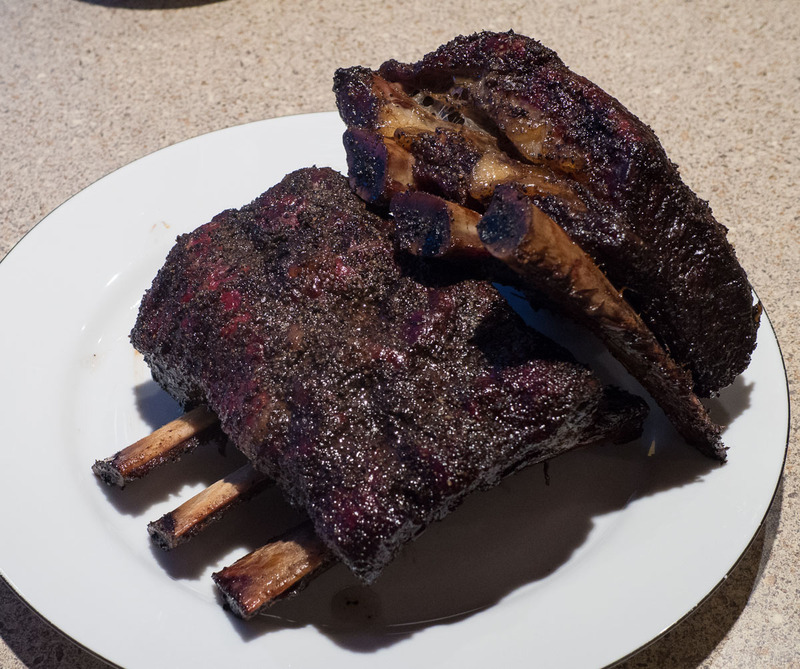 BBQ beef short ribs are much easier to do consistently and while they may not be quite as good as the best brisket I’ve ever had (Franklin’s in Austin if you are wondering), they will likely turn out better than brisket, all other things being equal. Done right, they are moist, juicy, a bit fatty and smoky. Heaven. I served it up here with a corn, black bean jumble. Corn is in season right now and I love it cut off the cob and just warmed through in a frying pan. It’s not hard to do but it takes time and patience. And good quality beef. Talk to your butcher. It’s really hard to get great beef from a supermarket. My butcher fixed me up with slabs of three short ribs. Beef he hangs in the back for 28 days. I cannot get this at a supermarket where I live. This is another one of those technique posts – a guideline more than a recipe. Mix salt, pepper and granulated garlic. This is your dry rub. Sprinkle generously over the beef (you may have some left over). Prepare your grill or smoker to run at 250-275F. You are smoking for 7-9 hours depending on the size of the ribs and smoker temperature so make sure you are set up to keep going. The ideal wood for Texas BBQ is oak but hickory works here as well. You are going for what’s called probe tender. That’s when you can insert a probe into the meat and not encounter any resistance. More scientifically you are going for an internal temp of somewhere around 195-200F. You are going to hit “the stall” along the way. The temperature of the meat will rise steadily until you hit somewhere around 155F-165F. Then it will just stop rising. That’s “the stall”. What’s happening is the meat is starting to sweat. Moisture is evaporating and cooling the meat. Don’t freak out. Don’t blink. Just keep going. It happens to every piece of meat – you just have to wait it out. Remember I said this takes patience. You can wrap the ribs in butchers paper at this point. Butcher’s paper is a nice compromise between not wrapping – which gives the best crust (or bark) but takes the longest and may dry out a bit at the surface and wrapping with foil which I think screws up the texture because you are effectively steaming the meat. This is BBQ beef short ribs not asian steamed short ribs. Wrap or not you keep smoking until you hit 195-200F. Alternately, you could pull the meat and put it in a 250F oven to finish it off. If you do this, then definitely wrap in butchers paper. Once you hit your target temp you will need to let the meat rest until it gets down to 175F. This can take 20-30 minutes. Once they’ve cooled, slice the slabs into individual ribs. Spoon some corn black bean jumble on the centre of a plate and top with one rib. Eat. Enjoy. When corn is in season I really like to make corn jumbles. You can season them any way you can think of. The trick is treating fresh corn with respect. Cook only until warmed through. Any longer and you might as well use frozen niblets. Hold the corn upright and cut the kernels off the cob moving from top to bottom with a sturdy knife. Heat the oil in a large frying pan. Fry the creole seasoning, onions and jalapeño until soft, then add the corn and black beans and continue cooking over medium heat until just warmed through. Adjust the seasoning to taste. Add the tomatoes and cilantro and mix.